I enjoy doing a Year In Review post to reflect on all that has happened the past year. The 2007 Year In Review was my very first one, and I’ve decided to do it again this year. This one is going to be a bit different than last years though. Here’s something I discovered while initially trying to create this post, and I recommend trying this for yourself. This just might help to inspire and motivate some folks to look at their goals, plans, and life differently in 2009. Take a look and see what this type of “Yearly Review” might do for you. This is a recap from the ActiveBrad “Archives”, BUT it’s not about me. 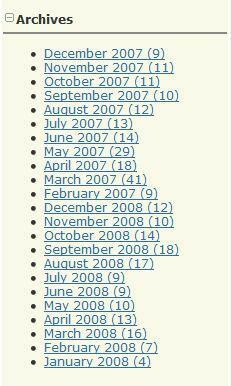 If you check out “YOUR Archives”, using the monthly links on your sidebar, it’s really very interesting. It’s kinda cool to look at your own Blog and go back through the year and “YOUR” life. What does your 2008 Blog on ActiveRain reveal to you, or about you? Have you ever looked back at the year through your Blogs viewpoint? What will YOU discover? Sorting your posts out by each month, lets you really see exactly where you’ve been, what you’ve done, and possibly where you’re going or where you might want to be in the future?!? Looking back at my year in review, I discovered many things about myself, my life, my goals and aspirations. I reviewed my Blog from a 3rd party perspective, like reading a book, and it shed a whole new light on ME. Who I am, what I like, what I don’t, and what I want to change? Your Own Blog may be the best goal setting and motivational resource you have. It’s your most accurate account for YOUR “Year In Review”.